This is done in the daily charts. I saw bar A which is a nice inside bar. But the bars next to to Bar A is a trading range. So I wait for a bullish bar to enter. 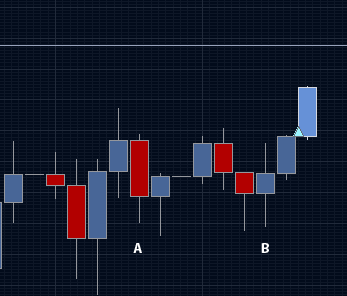 Bar B is a doji which means bears and bulls are almost equal. But have a potential as a signal to indicate a bullish trend. So I try and wait if the next bar is bull to enter the trade. It proved to be a bull and closed just above the inside bar’s range. So I entered long depicted in the arrow. As of now, its +63 pips.